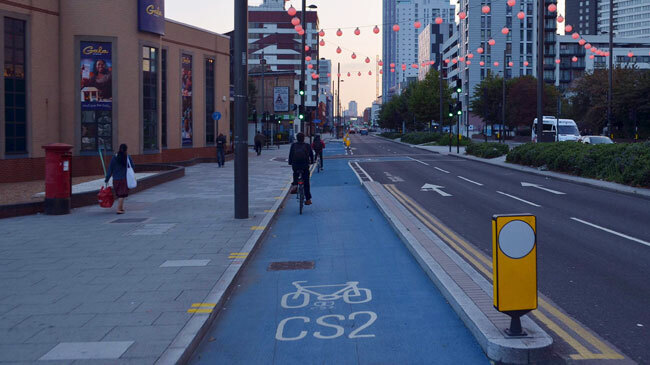 The DfT has published details of the six projects that have secured funding in the latest round of the ‘Innovation in Cycling and Walking Competition’. Under the competition, organisations were invited to apply for a share of up to £470,000 to be awarded to ‘innovative proposals that encourage more journeys by bicycle or on foot’. Three of the projects have been awarded a ‘second phase’ of funding, while the other three are at the ‘first phase’ stage. • A project by Central Bedfordshire Council designed to improve the safety of cyclists on rural roads through technologies to influence driver behaviour and alert vehicles to the presence of cyclists. In phase 1, the project team successfully developed a cyclist activated warning sign (CAWS). The phase 2 funding will be used to take CAWS through the design, implementation, operation and evaluation stages, with the aim of demonstrating the effectiveness of the sign. • The ‘Airhead’ project is setting out to design a significantly more portable cycle helmet which also delivers better head/neck protection than existing designs. Phase 2 will focus on the manufacture, development and safety testing of an inflatable helmet – with the aim of producing a collapsible cycle helmet which is EN1078 safety certified and ready for market. • A project by Alp Technologies aims to reduce the cost of owning an e-bike by using recycled batteries in a ‘novel electrical format’. During phase 1 a proof of concept prototype was produced, while phase 2 will focus on testing technical feasibility, and demonstrating the ‘industrial robustness and commercial viability’ of the product. • The Stride project aims to increase walking among older people by designing a wristband that combines fitness and health tracking functionality with a ‘state of the art’ personal emergency response system to alert if the person has a fall. • A project by Zeta Specialist Lighting aims to develop an unobtrusive, low cost, robust, solar powered variant of road studs for use on cycle and footways. The aim is to provide a sustainable light source that can be built into footpaths and cycle ways to improve night time safety. • The University of Nottingham is collaborating with Integrated Transport Planning to increase walking and cycling among university students and staff by creating an active travel dashboard. Phase 1 will develop a proof of concept prototype platform to provide decision-making information to operational staff, and personalised, real-time active travel choices for travellers.